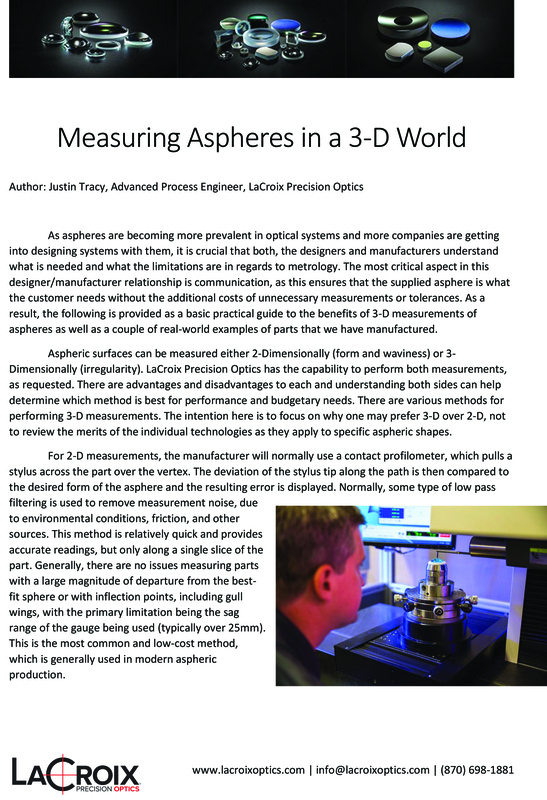 This white paper provides a basic practical guide on the benefits of 3-D measurements of aspheres as well as a couple of real-world examples of parts that we have manufactured. This white paper also goes into detail why one may prefer measuring aspheres in 3-D over 2-D, not to review the merits of the individual technologies as they apply to specific shapes. Also, we will distinguish the difference between measuring aspheres in 2-D (waviness) and 3-D (irregularity). Can use MRF to improve aspheric surface quality, which can reach λ/4, with reduced mid-spatial frequency errors.